Wall separators aren’t just a useful way to subdivide large areas of office space into multiple workstations; they can also help to separate workstations from the more leisurely spaces that are useful throughout the day. The personal workstation and even the conference room might be the go-to place for many on their lunch break or other moments of downtime. However, sometimes employees want nothing more than to get away from those reminders of work, in which case wall separators offer a welcome respite for the daily grind. No matter the size of your company, our wall separators are guaranteed to give an added visual and spatial dynamic to your run-of-the-mill office space while still offering a degree of privacy. This might be particularly important when a lack of space or budget means your break room needs to be an informal one. We carry all manner of wall separators, from single-panel acoustical dividers for when you might just need the odd, small space for brief “water cooler talk” among employees, to multi-panel, connectable partitions that can accommodate a much larger break room, replete with food-prep fixtures and table seating. Our single-panel portable dividers can range in size from 4’x4’ to 6’x6’ for perhaps a smaller break area. Made of 2-inch-thick acoustical fabric and framed out with anodized aluminum, these smaller-scale wall separators pack a punch when you specify upper windows of polycarbonate glass that help to minimize noise transmission while maximizing ambient light. Even better, no tools are needed to assemble these panels; the user simply slides the panels and posts together to create a workable space that even goes beyond the application of break room and into the realm of the personal workstation. We also carry popular multi-panel room separators which feature patented 360-degree hinges, letting you maximize the number of setup options at your disposal. Taking into account spatial constraints such as office size and existing workstation layout when considering your new break room, you can opt for an angled “L” or “C” shape, or you can give a more graceful curve to the boundaries of the break room. This wall separator is not just easy to fold but easy to transport as well. It’s highly durable in its build, while its aluminum frame lends itself to how lightweight and thus easily movable it is. Naturally, as break rooms are meant to deviate from normal company activities, office workers may feel the need for a higher degree of privacy of sound when socializing, since personal subjects can always be touched on in these settings. We offer room separators that value your need for acoustical privacy by controlling the acoustical conditions of your space. Polycarbonate and fabric are two amazing materials in terms of noise control. Polycarbonate is excellent at blocking sound and has often been used around cities for noise abatement in the case of such high-noise applications as freeways and railways. Our many available fabric wall separators help to absorb unwanted incident sound, making them an excellent choice for a peaceful break room. You don’t have to go all out with wall separators in order to have a functional, private break room that adds style to your office. We offer lower-cost alternatives to the above multi-panel, 360-degree dividers which, while not performing at maximum in terms of noise privacy, still offer many of the benefits of our higher-end room dividers including quality of build. Our portable room separators made of canvas feature the same 360-degree hinges that let you enjoy a high degree of flexibility when building out your break rooms. The lightweight and durable material make these room separators easy to roll out and put away. 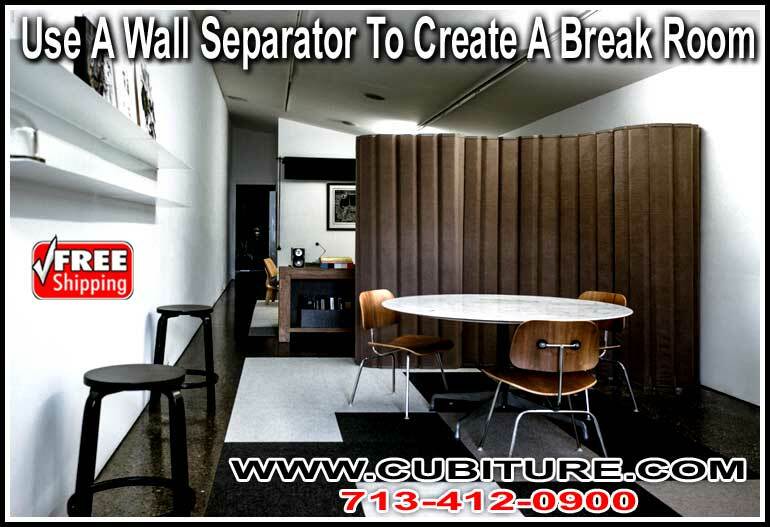 Cubiture specializes in bringing to you quality office furniture, and wall separators are no exception. We have decades of creative space-making under our belt, and with a wide selection of materials and styles to choose from, you can be guaranteed the right solution for your office break room. Give Cubiture a call and see how we can best match you with what you need!